ALBEROBELLO is a small town situated in the region of Puglia (there is LOTS of delicious food there) which is basically located on the hill of the “boot”. It is like nothing I have ever seen before, almost like a fairytale! I went there with my family and my wife Suzanne….and WOW! When we arrived, I couldn’t believe what I saw, it was full of small alley ways made from limestone bricks and I felt soooo tall next to the houses that I almost felt like a GIANT. 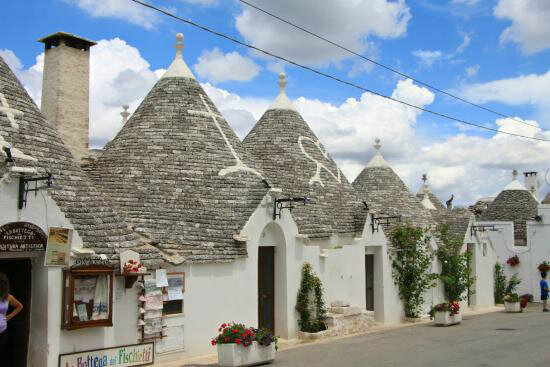 I shouldn’t say houses, because they are officially called Trulli. They are small, round shaped “mini-houses” built in prehistoric times and made with white limestone bricks and then grey stones which form pointy roofs on top. Each one has a tiny little chimney on top and they are all finished with a small stone at their very tips…to me, it’s just like adding a cherry on top! The way this city was built is just incredible and the Alberobello Trulli are now completely protected by World Heritage Law so no one can touch them unless they have passed all these special rules and regulations. 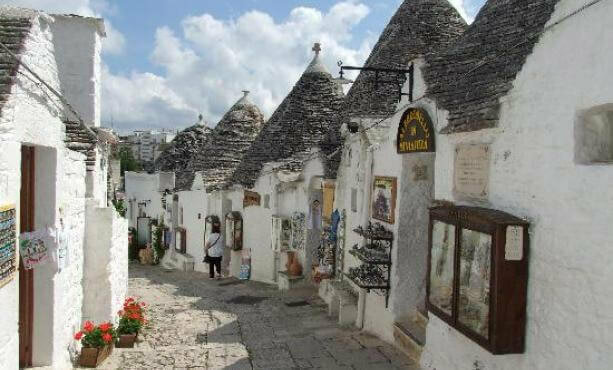 In many recent years, German and British tourists have invested in their very own Alberobello Trulli many of which are now open to the public and sell handmade treasures and souvenirs, some of them made up of the limestone found in the area. What I want you to know though, is the truth about the area and why these special little homes were built this way, this is the fun part! One of the older Italian men that still lives in the area and whose home has been passed down for generations said that they were built by literally layering stone on top of stone without any mortar to avoid paying taxes! This would simply make it easier to knock them down when there was word that the tax man was coming around because things were tough under the Kingdom of Naples! (Admittedly many historians have now said that they were built this way due to the type of conditions present in this area). No matter which story you wish to believe, reality is, you MUST visit this place. There is lots to take in and you won’t regret it…did I mention how AMAZING the food is in this region…? !